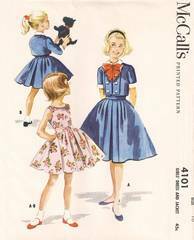 Vintage McCall's sewing pattern from 1956 for girls full skirted dress and short jacket. This simple yet charming sleeveless dress has an inset midriff band, very full gathered skirt, bateau neckline and back buttoned bodice. The short jacket has wide revers with button accents and a simple hook and closing at front neckline. Jacket sleeves may be short or 3/4 length. Collar and cuffs are detachable. Pattern is complete, uncut and in original factory folds. Envelope is in solid and clean condition with light wear to edges.